We take it for granted now, but do you remember how astonishing Shazaam (the app, not the Shaquille O’Neal movie) was when it first came out? Here was an app that could identify a song just by listening to it! And then once it identified the song, you could see the lyrics and buy the song in iTunes. The technology required to power the app blew everyone away. It was arguably the greatest music technology since the karaoke machine. 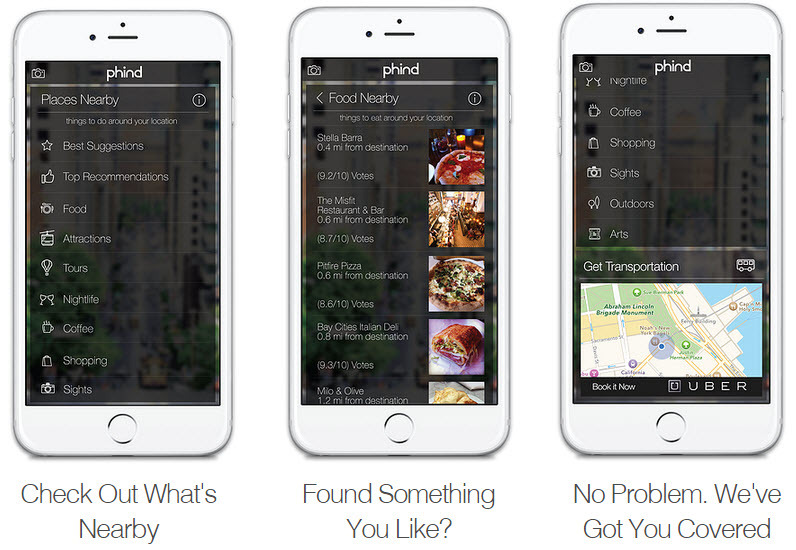 Phind, the wildcard winner of TechCrunch Disrupt NY, wants to be the next Shazaam. But instead of identifying songs, Phind wants to identify places based on photos taken by the user and then provide them with all the relevant information about those places and its surrounding attractions. Instead of typing in a search, the user can snap a picture of their surroundings with their smartphone and the app instantly begins compiling content, recommendations and reviews. Let’s say you see an Italian restaurant that strikes your fancy. Using Phind, you take a photo of the restaurant. The app instantly identifies the restaurant and then begins pulling from Yelp, Trip Advisor, Foursquare, Wikipedia, the restaurant website, and a host of other sites, to provide you with every possible snippet of information about the business. No more scrambling to find the menu or hours of operation. No more flip-flopping between apps. Phind goes beyond just presenting information. Thanks to the app’s integration with Uber and Viator (from TripAdvisor), without leaving the application, users can order an Uber to check out nearby or related sites, or even book a tour at the attraction they just captured on camera. The technology powering the app, which is currently patent pending, really is quite astonishing. The app first identifies the location of the user, then uses the location to do a comparative search within the database of 100 million images. Within 3-4 seconds, the app identifies the precise site, area, monument or business and begins returning relevant information. Co-founder Rishi Jhunjhnuwala has promised that in the future, Phind will also be able to make user-specific recommendations. If you’ve shown an affinity for sushi, Phind will identify your location and find you the nearest Omakase or all-you-can-eat. Currently the app is focused on locations in the United States, with plans to expand in the future. Phind has the advantage of being first on the scene with their technology, but it can’t be long before other, bigger companies enter the fray. Google and Facebook already use forms of image recognition. Google also has a massive database of geographical maps and images at their disposal. If Phind turns out to be significantly profitable, we can expect the big boys to enter the arena with digital guns blazing. Phind is clearly on the bleeding edge of a burgeoning market. For several years now, the Amazon app has been able to automatically look up photos of products. The Vivino app allows users to see relevant information based on photos of wine labels. The CamFind app promises to identify any and every image snapped. Now that we all carry high-definition cameras in our pockets, image identification is a future less pixelated than ever. But the strength of Phind isn’t solely in its image identification algorithm, as impressive as that is. What truly sets Phind apart, at least for the time being, is its talent at bringing everything together in one clean experience. In a world cluttered with excess apps, simplicity and unification is a beautiful thing. Hey Stephen! Would love for you to check out our latest update. We just launched into real time data for places on Friday – sort of a Shazam meets Waze, for places. I am thinking that this was only a matter of time. Very cool app. Great user interface and that is all that matters. Right? You said it there, the magic of an app like this is bringing all these different apps together in one spot. This is an awesome app. The ability to take a picture, order an uber, and find relevant information is pretty awesome, and at the same time scary. The amount of stuff you can do with apps now is completely absurd, but having an app figure out all this stuff from a picture is just a couple steps away from having real time data on a heads up display relayed back to you on everything. I could see this integrating with google glass quite nicely. Thanks Rick! We at PHIND love hearing from users that are enjoying our experience. We’re excited about the future of PHIND and what else is in store. Stay tuned!